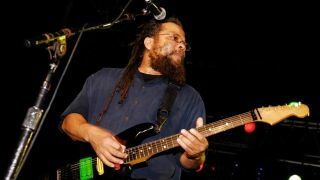 Bad Brains are aiming to raise $100,000 to help with guitarist Dr Know’s medical bills. Dr Know, aka Gary Miller, suffered a heart attack in November last year and was only given a 5% chance of survival. But after pulling through, he’s expected to be allowed home soon. However, he will require ongoing treatment and his bandmates are asking fans to help via a GoFundMe campaign. They say: “Doc suffered cardiac arrest in early November last year. His condition quickly progressed to multiple organ failure, and he was on life support for almost two weeks. At the time, his doctors gave him a 5% chance of survival. But by the power of PMA, love and family, he was able to pull through and survive. “He spent nearly three months in the hospital, until he was finally able to be transferred to a medical rehabilitation facility where he is getting the proper physical therapy and treatment that he needs to make a full recovery. “In medical rehab, he continues to make incredible progress every day. Doc and his loved ones are now confident that he will make a full recovery and continue to touch our lives with his incredible music, kindness, and positivity. Bad Brains have also thanked fans for their ongoing support.